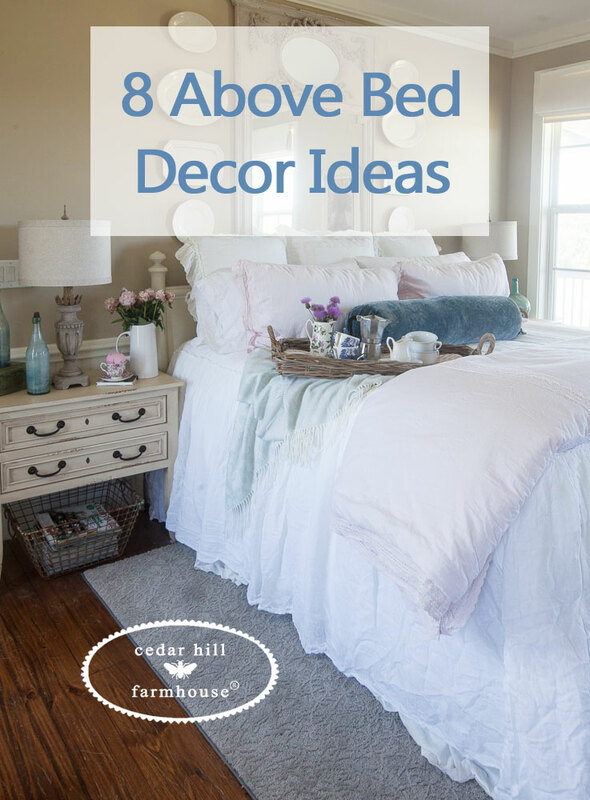 I love today’s topic, 8 above bed decor ideas. There are so many things you can put above your bed. It’s a great way to add a very personal touch to your personal space. You can go a lot of different directions, and I’m going to show you some places I’ve been. I made a corona a long time ago for my guest room, but got tired of it and gave it away. Now for the girls room, I’ve tried it again, but these were purchased from Restoration Hardware. They are sold out, but you can find other options that are similar. 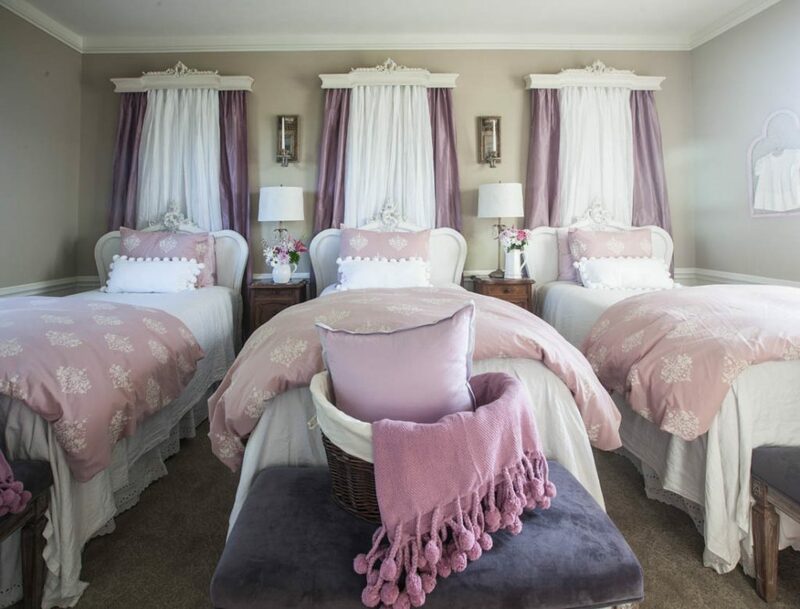 CLICK HERE to see more of this room. I love this large plaque and thought it would be perfect in our room. It’s width is almost the width of our Queen bed, and I enjoy the carved details (although it’s a reproduction.). It’s from Ballard Designs, CLICK HERE. (Not sponsored, just sharing my resource) CLICK HERE for more photos of the room. Today, I’m sharing two podcast episodes. The first one was just released today all about the new bedroom decor trends for 2018. You won’t want to miss this one. This second episode is about today’s blog topic, things to put above your bed. So I thought you might enjoy listening to this episode also today. This is a very pared down, monochromatic look for a room. It’s simple and elegant. I think it can work very well for a bed, but the mirror and sconces need to be sized appropriately for the bed. Were this a Queen bed, I would have used a larger mirror. CLICK HERE to see this room. This room is the same room featured with the coronas above. I had these sweet baby dresses hung above each bed for years. I think this is a great idea to display something special above a bed. Make sure the wall decor size works for the bed size. Also note the headboards are small and needed something else. Yes, this is actually outdoors, but you can see that I’ve used a window screen as art above my daybed. I converted it to hold the sweet little mason jars filled with flowers. CLICK HERE to see more of this project. 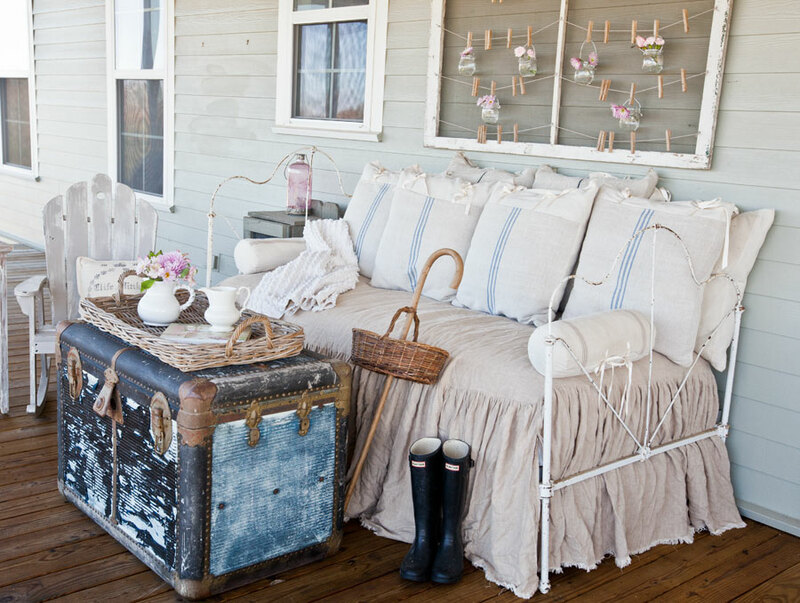 I have the window screen above a daybed, but you could use it above a regular bed. This is actually a set of louvered doors and not shutters. I bought them new, and then simply painted them, then hung the antique mirror at the top. CLICK HERE to see more of this room. The doors could even be used as a headboard. 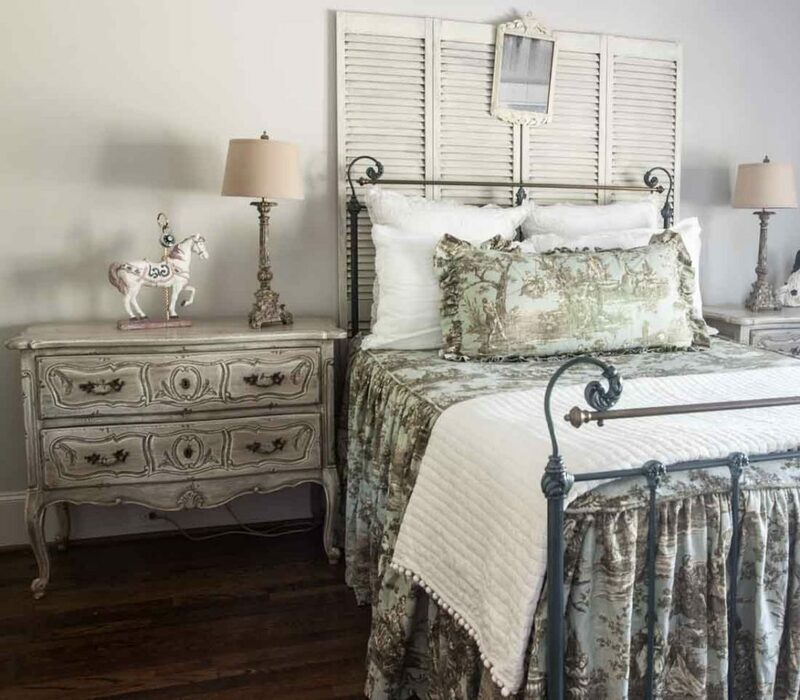 The bed is an iron bed, so it didn’t need a headboard, but you can see how the doors gave the bed more presence. 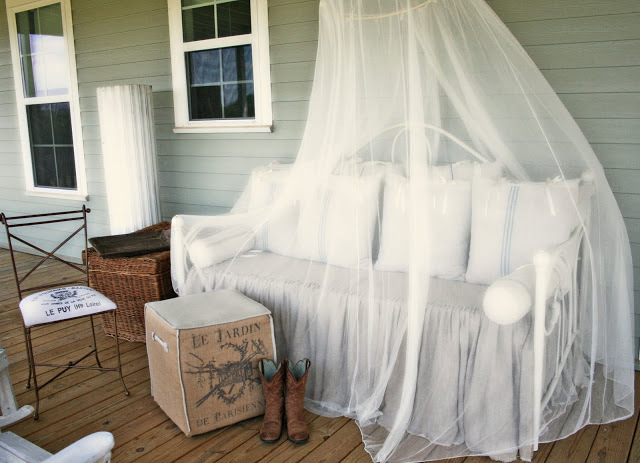 Although this look is on the back porch, you could use mosquito netting indoors if you like the look. You just need to be sure it won’t get tangled up in a ceiling fan. I think it’s a fun look! 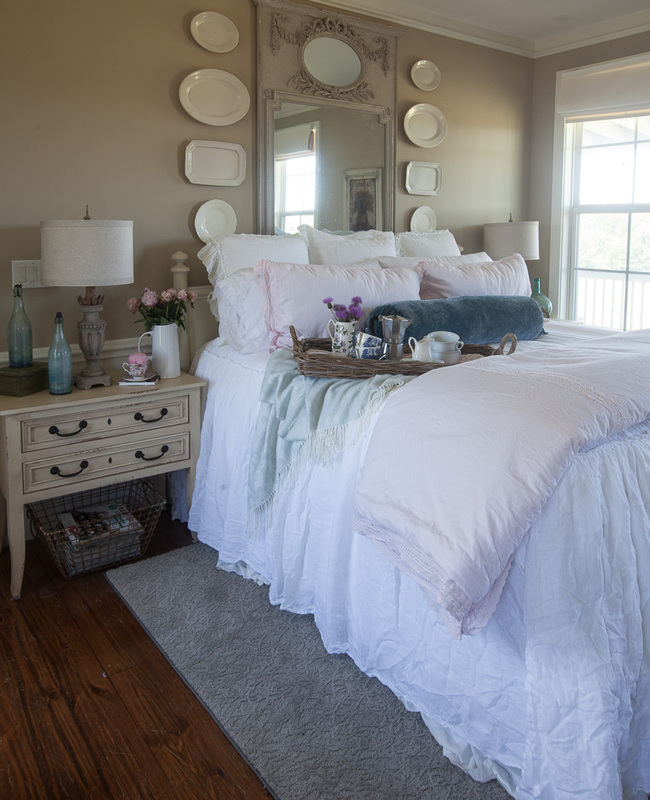 I used a very large French mirror above this bed, then added the platters since the bed was so much wider than the mirror. Yes you do need to make sure the mirror or other artwork doesn’t fall on you in the night. This mirror is actually behind the headboard, so if it gets loose from the wall, the headboard will keep it from leaning forward and it should fall behind the bed and not on top of it. Surprisingly enough, I do think about these things. And I know a lot of people live in earthquake prone places. If that’s you, then you might enjoy the ‘nothing above the headboard’ look. It’s a thing, and it can be quite lovely. 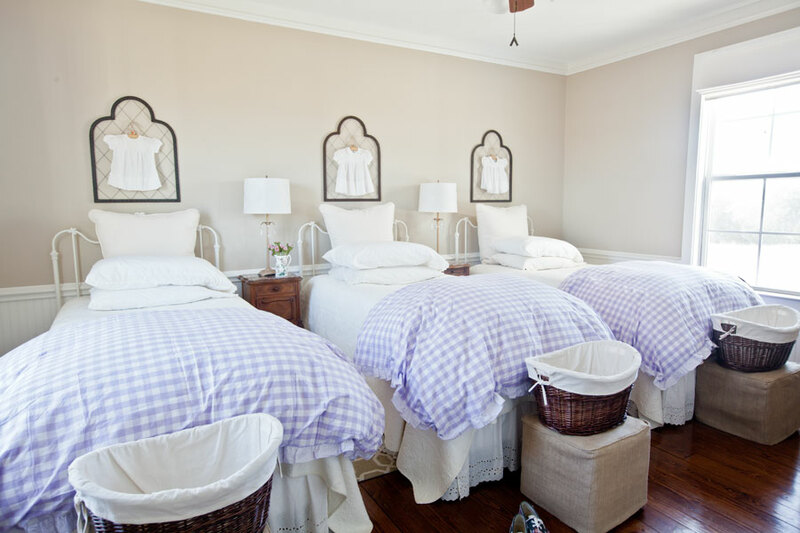 It just means the focus will be more on the bedding so you’ll want to give your bedding extra attention in that case. I didn’t show a bed with botanical prints above the bed, but I do LOVE that look! You can find some botanicals, plaques, and other cool things on my Amazon page. affiliate link Amazon.com/shop/cedarhillfarmhouse. So that’s 8 above bed decor ideas for your home. I hope you got some inspiration and ideas for how to make your home a perfect reflection of you and your style. Great photos 🙂 Very good inspiration as always. Jo, I don’t live there, so I can’t just run a tape measure for you. I would add the width of each bed -39 inches plus whatever aisle you want between the beds and wall. You’ll need 4 aisle widths. Add that up and compare to your room, and that should tell you what you need to know. Hi Anita…perfect post for me today…just got a new bed and need a bit of inspiration…once again…thank you! Your girl’s bedroom is gorgeous, love the coronas and the colors are so pretty. May I ask your paint colors in those rooms? (More change IS coming!) 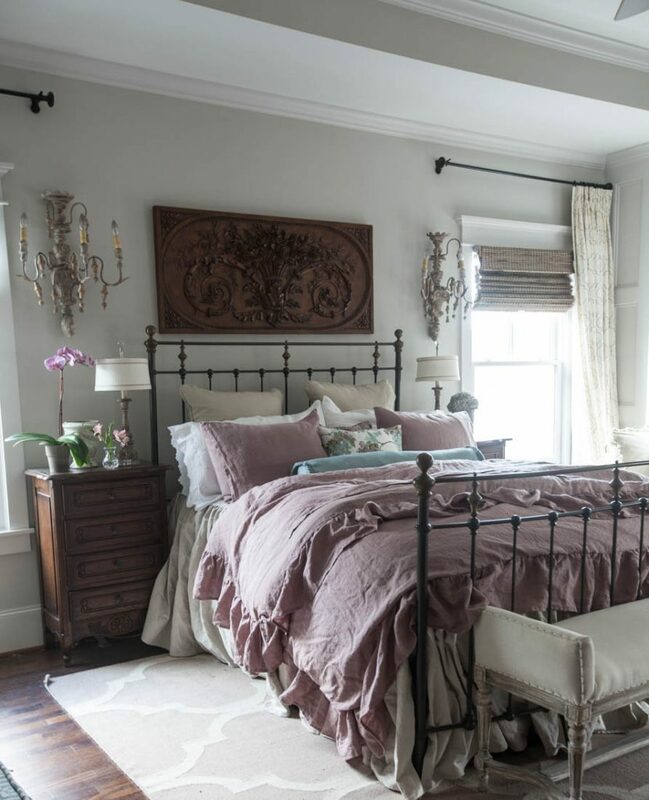 The girls room is an earthy tone and I really like it and the “whitish” shade of the other bedrooms seems a nice in between. At this point a few more samples painted on my wall might push me to make a decision! Thanks again for your blog. It’s a favorite of mine and I wish you and your family God’s blessings in these new exciting times of adult daughters. I still have the botanicals I got from you above my bed. They still look great! What a great post today, thank you. I am working final touches of our remodel. You definitely inspire me to stretch the limits! I love our new bedrooms, the colors I chose are beautiful for a country french blue theme in a ranch house on our mini farm in central phx…. LOL. One bedroom is a horse them I can work with that. My other is sort of a mish-mash and I’m NOT loving it!! This is where your blog and books are useful for me. 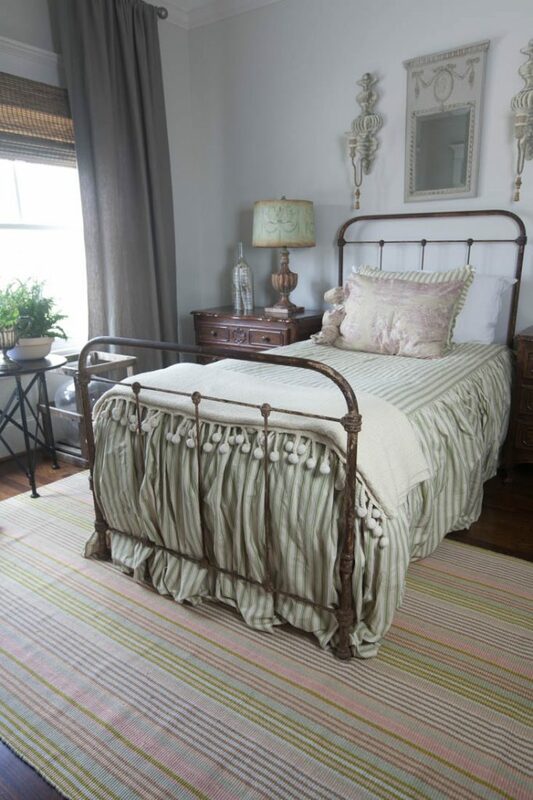 I am wondering where to get pretty and good quality wrought iron bed?? I love the beds you are showing above! I’ve gotten beds some from Charles P Rodgers, and some from Target, Joss and Main, and Wayfair I think. Be sure to check reviews before buying online. Love your bedroom ideas. Where do I find a long bolster pillow like the blue velvet one in one of your photos? Would love one on my bed in the master bedroom which has a queen size bed.